I am indeed honoured today to offer heartfelt congratulations to the Grade 6 Class of 2015 who will be exiting Primary School and the Graduating Class of the Secondary Division. Even though you may be overwhelmed with joy and proud of your accomplishments, remember that this achievement is but a stepping-stone to the rest of your lives. To the Grade 6 graduates, this afternoon I would like to encourage you and offer these brief words of advice. As you begin this journey of secondary education, I want you to know that you are not too young to consider what your contribution to this Territory would be. Primary school may have been easy for some of you. High school, however, can be daunting; you will learn new subjects, and experience new and different challenges. Whatever your experiences, keep your focus and always remember the values and principles instilled in you by your parents and reinforced by your teachers. Begin to set serious goals for your life and remember that those goals will not always come easy. You will have to work hard, be determined and I assure you, success will find you. High school graduates - residents of Anegada now more than ever before have opportunities to engage with their Government, and accordingly we have listened to many of the concerns from this community. Under the leadership of our Premier, Hon. Dr. D. Orlando Smith, OBE, we have sought to address some of those issues within the wider development of the Virgin Islands so that as the Territory is developing all of our islands and all of our residents are part of that development and have opportunities for advancing their own lives. We have made continued investments in your lives through programmes such as our Youth Employment Services and Apprenticeship Programme, the development of our National Youth Policy, Emerging Fellows Programme and various other initiatives to empower young people. I encourage you to take advantage of such offerings so that you can develop your skills and be prepared to assume your roles as responsible young adults within Anegada and the wider Virgin Islands. I encourage you to finds ways that you too can be part of the development of the Virgin Islands by exploring opportunities right here on Anegada. With business development support and financing from our National Business Bureau, you have the chance to open new businesses to service this community and help in its development. Anegadians have had the chance to successfully manage this island for decades, and with your youth, creativity, intuitiveness and this type of support from our Government, I want to encourage you to find ways to be part of the economic and social advancement of Anegada through entrepreneurship. Do not allow anyone to tell you that you are too young to make a difference in your community. The Territory needs you and I ask you to help advance the Virgin Islands by marrying your personal success, with the success of the Territory. The 2015 Grade 6 Classes will go down in history as the first set of students who did not have to sit the National Primary 5 Examination as a graduation requirement to pass on to the secondary level of education. The Ministry of Education made an informed decision last year to end the era of the Primary Five Examination so that teachers can focus on offering quality instruction to our students, without the stress of teaching towards the examination. However, this did not mean the end of accountability on the part of the Ministry of Education and Culture. Over the next four years, new initiatives will be created and implemented to ensure that students are groomed from the primary level to become good citizens. In addition, initiatives which have already been implemented will be analysed to measure the progress and make adjustments where necessary. One such initiative is the implementation of the National Citizen Service Programme at the primary school level. This programme is one in which each Grade 6 student will be required to engage in a number of monitored hours of community service, maintain a log of the service and write a reflective essay on the impact of that service which he/she would have completed. This year, the Ministry of Education introduced Key Stage Assessment, to determine the levels at which students are working at key intervals. The assessment is designed to provide information to the Ministry regarding students’ strengths and weaknesses at key intervals within their educational development. The results will be used to provide information to schools and parents about the grade level at which students are actually working so that we can quickly address any concerns. It is also important to note that the Key Stage Assessment is not a requirement for promotion. be productive citizens and future leaders of the Territory of the Virgin Islands. The 2015 Graduating Class of the Secondary Division will go down in history as the last Form Five students as with the introduction of K-12 education, inclusive of an additional year in secondary school, our next graduating class will be our Grade 12 students in 2017. Grade 12 students will now have the option to sit CXC CAPE subjects in the final year of secondary education with the aim of completing these subjects during the first year at H. Lavity Stoutt Community College. 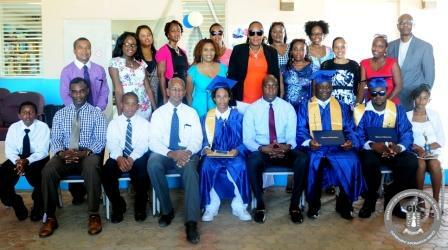 This high school graduating class is the first group of graduates of the Claudia Creque Educational Centre who has had to complete the National Citizen Service Programme, as an additional requirement for graduation. I am pleased to note that even though there was initial resistance by students, in some of their reflective essays students indicated that they saw the benefits of the programme and actually enjoyed giving back to the community. This tells me that this programme has been effective in instilling in our young people, the importance of serving their communities and truly adopting national pride. This Graduating Class is also the last group of students at this institution who had to sit the National School Leaving Examinations as a requirement towards graduation. The Ministry has again made an informed decision to end the era of School Leaving Examinations, which were equivalent to 15% of the total academic requirement over the senior years, and to introduce a credit system in the near future. The rationale for the introduction of credits is to offer students a wider range of subjects for study based on ability and their career interests and to further align the Virgin Islands’ Education System with internationally accepted standards. During this school year, the Claudia Creque Educational Centre has had some challenges. The Ministry held discussions with the community, and the administration and staff of the institution to obtain first-hand information of the issues and to collectively arrive at a solution, which will be in the best interest of all stakeholders. We will ensure that the issues the community is concerned about are addressed. This will be done with the implementation of School Management Committees at the beginning of the next school year. The Committees will consist of both public and private individuals that will assist in the overall management of schools, helping to resolve matters much fasters and providing greater support for the administration of schools. It is my anticipation that such committees will help to quickly address and resolve matters similar to what this school has been facing. This community will be happy to note that commencing this July; we will begin the construction of a wheelchair accessible building comprising three classrooms, inclusive of a Science lab. I will be working aggressively to see that this project come to completion on time and that we provide students at this institution with comparable facilities as those on our Sister Islands. Teachers, I thank you for your continuous hard word and dedication to the education of our students. You have worked to ensure that your students receive quality education and today have achieved success. I want to also encourage you to continue to develop yourselves. Take advantage of the professional development organised by the Ministry of Education. Create and maintain Professional Learning Communities in which you can share and gain ideas to improve instruction. Principal and staff, your kindness, dedication, commitment and perseverance have helped these students to blossom. Parents it would be remiss of me not to also offer you congratulations on the achievement of your children. Continue to lend support to ensure the ongoing progress of your child academically and spiritually. Do not slacken the reins; as a matter of fact, pull them a little tighter to ensure that your children stay focused on the positive and are working to achieve their goals. I want to ask this entire community to work together for the future of the children and the development of this island. Claudia Creque is a small school, the teacher to student ratio is less, students are afforded more time and interaction with teachers, and for those reason, this school stands to be one of the highest achieving schools in the Territory. But in order to get there, parents and teachers and the wider community must work together for the benefit of students and to the larger benefit of Anegada and the Virgin Islands. I encourage all of us, even from the Ministry level to recommit ourselves to working in the best interest of all of our students. At this time, I offer special congratulations to the Valedictorian, Lawrence Anton Kirton-Wheatley. Lawrence received 9 subject passes at School-Leaving and has sit 6 CXC subjects, thereby making him eligible to receive a government scholarship pending 5 passes in the CXC CSEC examinations. I also commend the second top student, Revonne Asher White and the third student, Michael Leonardo Creque. Congratulations to all of you! On behalf of the Ministry of Education and Culture, I again take pleasure in congratulating the Grade 6 students who will be moving on to secondary school, the 2015 Graduating Class, the teachers, parents and extended families. Congratulations! Thank you!